All types of PU Fittings availaible. 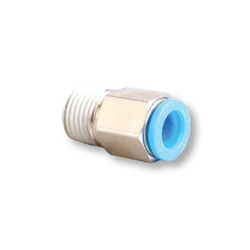 We offer an extensive range of premium quality one touch fittings which include male connectors, equal T connector, and union elbow. Fabricated using high grade raw material these can be customized as per the blueprint provided by the client. The push-in type one-touch fittings series from Vijay Air Control is ideal for pneumatic piping joints, excelling in quick fitting, accurate jointing and compact design. One Touch Fittings have been deeply admired and acclaimed in the market owing to its longer serving and durable life. Furthermore we offer this hot-selling assortment at a very genuine market price. Standard plastic fittings: AEROFLEX plastic fitting series is of all the specification, including PT metric thread and G thread, inch size and America size. 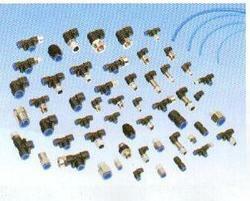 The structure is various, including from straight fittings, angle fittings, tee fitting, flow control fittings. AEROFLEX Series fittings are famous all over the world. We offer a wide & comprehensive ranges of PU One Touch Fittings.